For quantitative determination of α-glucosidase activity and evaluation of drug effects on its metabolism. • High sensitivity and wide linear range. Use 20 μL sample. The detection limit is 2 U/L, linear up to 250 U/L. • Homogeneous and simple procedure. Simple "mix-and-measure" procedure allows reliable quantitation of α-glucosidase activity within 20 minutes. α-GLUCOSIDASE hydrolyzes the terminal, non-reducing 1,4-linked α-D-glucose residues with release of α-D-glucose. 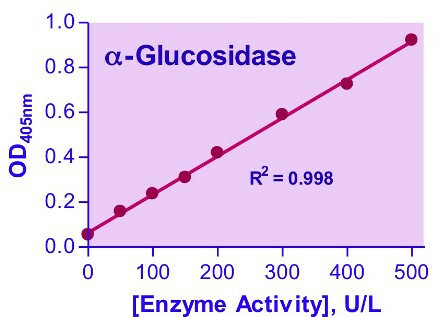 α-Glucosidase is needed by all animals to hydrolyze maltose to glucose for use as a food. Aberrant activities have been implicated in diseases such as diabetes and Pompe disease. Simple, direct and automation-ready procedures for measuring α-glucosidase activity are becoming popular in Research and Drug Discovery. BioAssay Systems’ QuantiChrom™ α-Glucosidase Assay Kit is designed to measure α-glucosidase activity directly in biological samples without pretreatment. The improved method utilizes p-nitrophenyl-α-D-glucopyranoside that is hydrolyzed specifically by α-glucosidase into a yellow colored product (maximal absorbance at 405nm). The rate of the reaction is directly proportional to the enzyme activity. Applications For quantitative determination of α-glucosidase activity and evaluation of drug effects on its metabolism.